Tropical Storm Trami may not be making landfall in the Philippines, but it was close enough to bring heavy rainfall when combined with monsoon rains. NASA's Aqua satellite captured those extensive rains in an infrared image when it passed overhead from space. Tropical Storm Trami enhanced rainfall from the monsoon, and caused flooding in the northern Philippines, including Manila, the capital city. 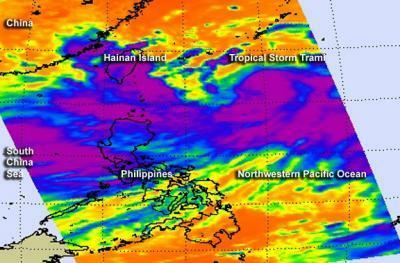 The northern Philippines were hit with two nights of heavy rainfall, but Trami is now moving to the northwest and away from the northern Philippines. According to reports from the Associated Press, many roadways were flooded. A report from Malaysia's Star on-line noted that three people were killed and two were missing as a result of the flooding. The Atmospheric Infrared Sounder instrument known as AIRS that flies aboard NASA's Aqua satellite captured an infrared image of Tropical Storm Trami's cold clouds combined with rainfall from the monsoon on Aug. 20 at 05:05 UTC/1:05 a.m. EDT. Clouds and showers from the combination blanketed the northern half of the Philippines and dropped heavy rainfall. NASA's Aqua satellite captured this infrared image of Tropical Storm Trami (purple) on Aug. 20 at 05:05 UTC/1:05 a.m. EDT when it was blanketing the northern half of the Philippines and dropping heavy rainfall. Two declarations of "state of calamity" have been issued as a result of heavy rainfall and flooding, according to the Star-online. Those areas include the Cavite province, southwest of Manila, and the town of Santa Rosa in the Laguna province. On Aug. 20 at 1500 UTC/11 a.m. EDT, Tropical Storm Trami had maximum sustained winds near 60 knots/69 mph/111 kph. It was centered near 23.6 north and 125.6 east, about 211 nautical miles south-southwest of Kadena Air Base, Okinawa, Japan. Trami is moving to the west at 12 knots/13.8 mph/22.2 kph and is expected to become a typhoon before making landfall in northern Taiwan tomorrow, Aug. 21. After Trami moves across extreme northern Taiwan it is expected to make a final landfall in eastern China.